“Whale” You Be My Valentine? 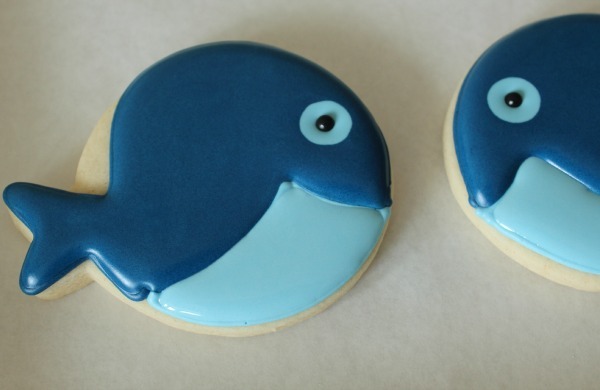 These little whale cookies might be one of my all-time favorites. I got the idea for this set from one of my favorite corny Valentine’s Day jokes. Hardy har har. Get it? 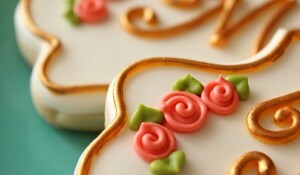 For the cookie I used a balloon cutter and added a wonky flower to some to create a spout. Begin by outlining the cookie as shown below. 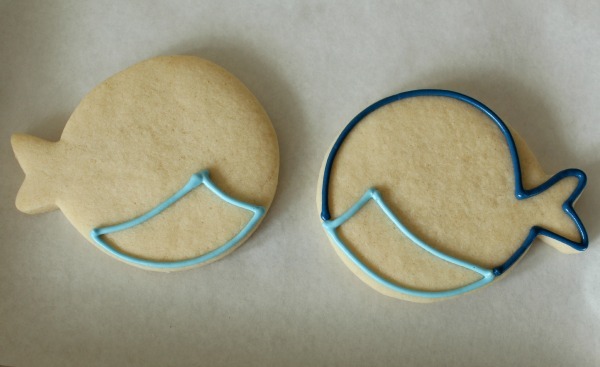 Next, fill the dark blue area with flood icing. Once the top portion is flooded, place a dot of lighter blue flood icing onto the base layer and use tweezers to drop in a black sugar pearl. Remember, you have to work quickly! Give the dark blue icing a bit of time to set, then flood the lighter area and let dry. Finish up by using light blue icing to add the final details. 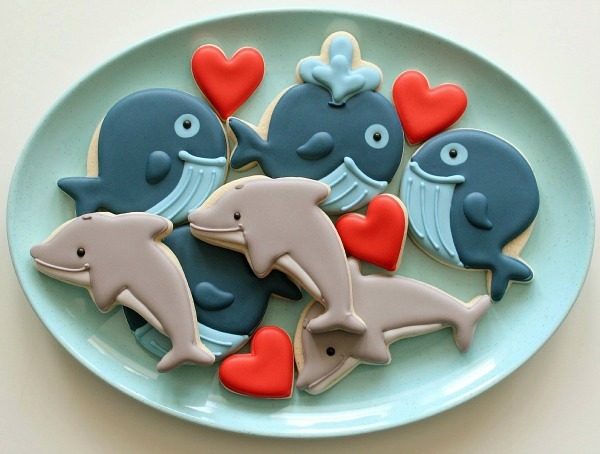 Paired with a few simple dolphin cookies these are a perfectly adorable Valentine’s Day cookie collection. 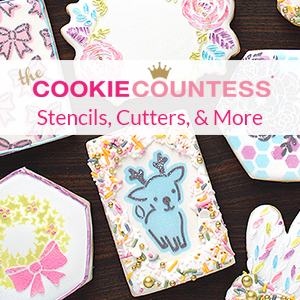 Have a relaxing and restful Sunday, cookie friends! Son perfectas y preciosas. Me encanta tu trabajo siempre impecable y adorable. These are so freakin’ cute, Callye! I LOVE them!! I get it and I love it! Corny is fun and these cookies are great! I love it! I am laughing out loud!!! There’s something always surprise me : the quality of the details. You think to each of them and this is the reason why they are marvelous. So sweet! 🙂 Such cute valentine themed cookies, Callye! So cute and creative! I might see if I have time to make these for girls classes! HOW CUTE!!! 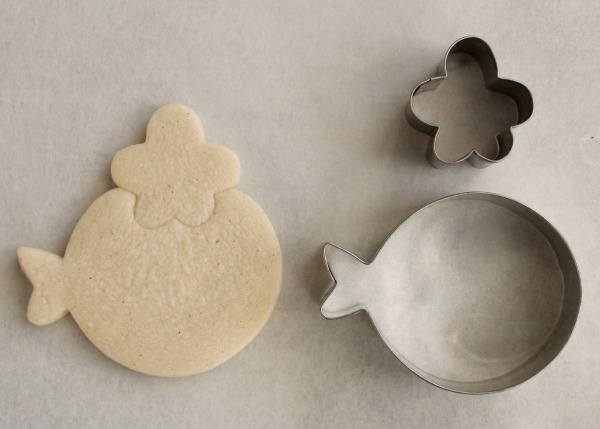 I love the flower cookie for the spout! So SmArT!!!! 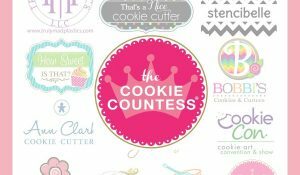 Thank You Sugarbelle for sharing your cookie inspiration. You should come out with a book about it. I would be the first one to purchase your book 😀 Thank You!! Thank You! 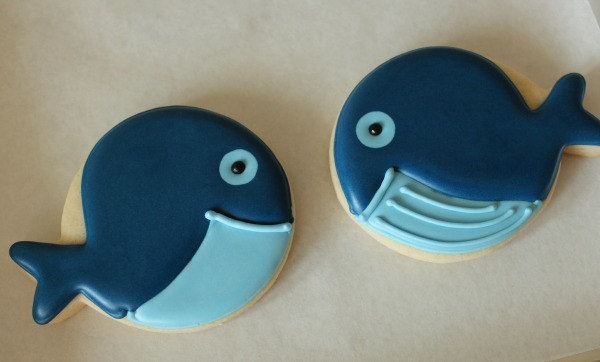 Whale, you really blew me out of the water with these cookies! I think you did it on porpoise, too. 🙂 Puns aside, this set is so adorable! I love the water spout detail!! Soooo super cute! You are soooo amazing! 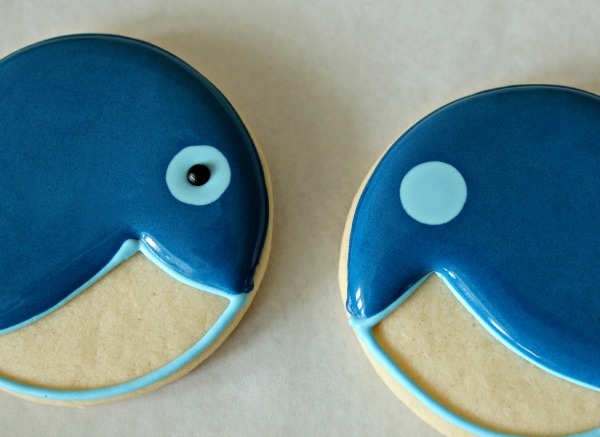 These have to be the cutest cookies I’ve ever seen! And I love the corny joke. That’s right up my alley. Thank you for the inspiration! These are so cute! 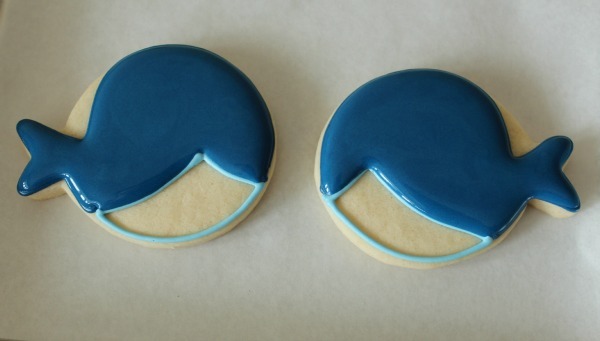 I love punny cookies!! Seriously, the most perfect dolphins I’ve ever seen!!!! And the whales are pretty darn cute too! Cute, cute! Love those dolphins! I know I’m going to sound SO dense here but I don’t quite understand what the heart and dolphin are to be saying. 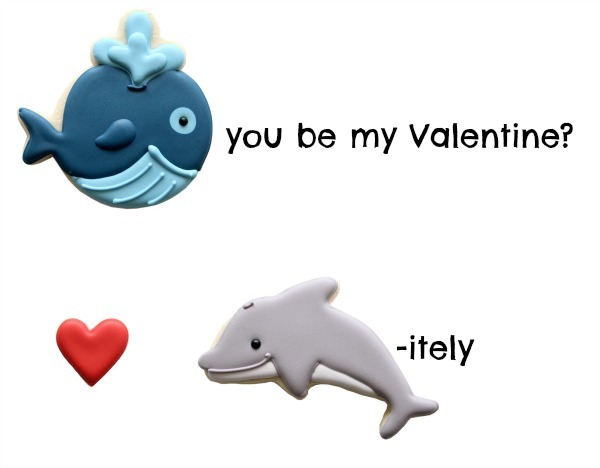 I get the whale part which is “whale (will) you be my valentine? I understand, I think, that the dolphin is part of definitely but I don’t see how that and the heart fit into the joke. I don’t know the ages of everyone but the joke must be either before or after my time because I’ve not seen this before. What am I not getting with the heart cookie? Last year I was planning a bee themed birthday party and you posted your bee cookies so I had to run out and get the bee cookie cutter. 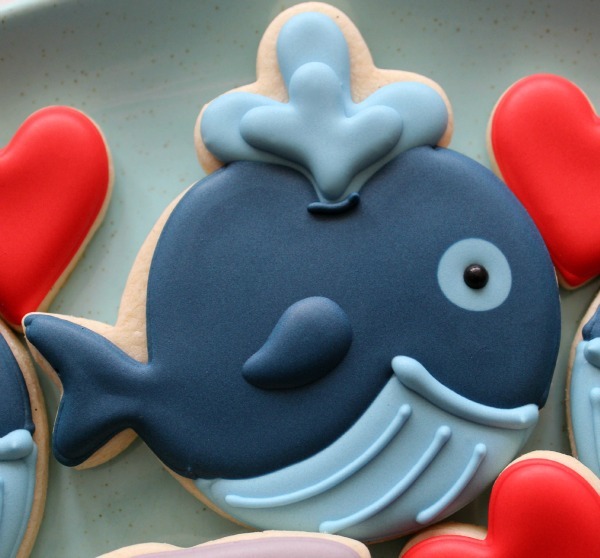 Now I’m planning an under the sea theme party (my daughter is obsessed with whales) and you’ve got me wanting to make cookies again with these cute whales!!!!! 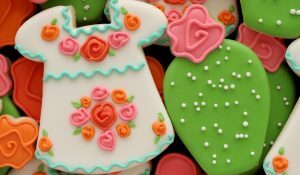 Preciosas galletas, como todas las que haces. Sin duda eres la mejor! Will you please tell me how you made the dark blue color? I always use Americolor but I don’t have one that looks like this blue that you used. Did you mix two colors to make it? Thanks in advance for you reply. I mix navy with a touch of black. Hope that helps! Hi! 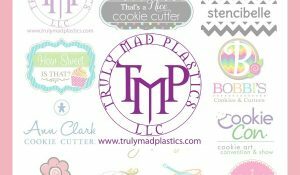 Can you tell me how to cut out the cookie with two cookie cutter? with the balloon and flower. Do you have a tutorial for the dolphin? He is adorable! Thank you for all the pointers, i just did my first trial today, and my cookie decorations came out quite nice. Is it possible for you to put a step-by-step guide to decorating a dolphin as you show the whale in this post? My dolphins look fat.